Jan. 12, 2015 - Statement of NSBA - The National School Boards Association (NSBA) announces the January 2015 launch of its online donor portal in support of its 501(c)(3) work on behalf of America’s public schools and our nation’s public school children - Stand Up 4 Public Schools at www.standup4publicschools.org. Alexandria, Va., (Dec 11, 2014) - The National School Boards Association applauds today’s historic action by the Federal Communications Commission (FCC) to modernize the E-rate program and improve high-speed broadband connectivity for rural and remote schools and libraries across our great nation. 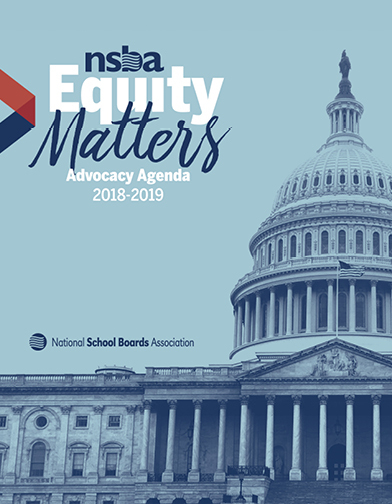 Alexandria, VA (Nov. 24, 2014) —NSBA, in support of the State of Ohio, has joined the National Education Association (NEA), the American Federation of Teachers (AFT) and the Ohio School Boards Association (OSBA) today in filing a “friend of the court” (amicus) brief in the U.S. Supreme Court in the case of Ohio v. Clark. At issue in this case is whether teachers or other school personnel who serve as mandatory reporters of suspected child abuse should be treated as law enforcement agents for purposes of the Confrontation Clause, a constitutional protection under the Sixth Amendment that grants those accused of a crime the right to confront witnesses. Washington, D.C., (Nov. 17, 2014) – National organizations today today expressed their strong support for Federal Communications Commission Chairman Tom Wheeler’s proposal to expand students’ and library patrons’ access to the Internet and permanently increase the funding level of the E‐Rate program by raising the cap by $1.5 billion. Read the joint press release. Alexandria, Va. (Oct.17, 2014) — The National School Boards Association (NSBA) joined a “friend of the court” (amicus) brief filed by the State and Local Legal Center (SLLC) and multiple signatories that asks the High Court to affirm the District of Columbia Circuit’s holding in the case of Perez v. Mortgage Bankers Association. At issue is whether state and local governments should be notified and allowed to comment before federal agencies change interpretations of their own regulations. Alexandria, Va. (Oct. 15, 2014) – A new report released today by the National School Boards Association’s (NSBA) Center for Public Education (CPE), examines the key role of informational reading in preparing students for college, the workplace, and day-to-day life. While U.S. students overall are good readers of literature, CPE’s analysis shows that their performance drops dramatically when tasked with reading non-literary texts. Alexandria, Va. (Oct. 14, 2014) - After careful deliberation, the National School Boards Association (NSBA) has decided to terminate its partnership with R.J. Reynolds’ “Right Decisions, Right Now” program. This action is effective immediately.